After the Mahabharat War - How long did Pandavas rule? Aswathamma killed all the upapandavas (children of pandava brothers with Draupadi), shikandi and dhristadhyumna and several others in the 18th day night of the war. When confronted by the pandavas, He launched a Brahmashira to kill Uttara's womb (only to be saved by Krishna and to be named by him as Parikshit). Krishna cursed him to be an immortal, who will be filled with excrutiating pain because of injuries, with blood and pus oozing out of his injuries, who will find ways to kill himself to relieve the pain but cannot do so, who will lose contact with humans, after removing the gem on his forehead. Pandavas got the blessings of Kunti, Vidura, Dhritarastra and Gandhari and ruled both Hastinapur and Indraprasta reigns together. Dhritarastra tried to kill Bheema while offering blessings, but after demolishing an Iron Statue, mistaking it to be Bheema, he regained his senses and blessed the pandavas. Yuyutsa became the guardian for Indraprasta and took charge of it till Karna's 9th and last son (the only son of Karna who remained alive) achieves sufficient age to takeover the reign as the King. Pandavas ruled the Kingdom for 36 long years. They conducted several Rajasurya Yagas and Aswamedha Yagas and Yudhistira became a grand emperor (Chakravarty) for the entire nation. They took care of Kunti, Vidura, Dhritarastra and Gandhari with great care. 15 years from the beginning of the reign, these 4 decided to go to the forests on a voluntary exile (The location is somewhere in the present day Uttrakand). There, Vidura receives a peaceful death and passes away. The remaining three died in a forest fire. In the 37th year of the Pandava rule, The yadavas had a great rebellion and fight and they nearly wiped themselves out. Krishna and Balaram also left the world after retreating to the forests and the city of Dwaraka was submerged into the sea. By that time, Parikshit (Grand son of Arjuna and Subathra, son of Abhimanyu and Uttara) was crowned as the king of Kuru dynasty as none of the Upapandavas (sons of Pandava brothers with Panchali) or the other sons of Pandavas survived the war, the Dwapara Yuga was on the verge of ending and Kali Yuga was about to start. And also, chaos and adharma slowly started creeping into King Parikshit's reign. Pandavas and Panchali (or Draupadi) decided to climb the Himalayas as a final penance/yatra (sort of) to reach heaven. They climbed the Himalayas and were accompanied by a dog (Lord Yama in disguise). As they climbed/walked their way to the top, one by one they started falling and dying, and ending up in hell. Apparently, the reason for their deaths is because of their desires, issues and troubles caused by them and their own pride. Panchali falls first possibly because of her pride and she favoured Arjuna more among her pandava husbands. (she had a soft corner for him.). Sahadev and Nakul fall next possibly because they were prideful about their looks, Arjuna dies next because he was prideful about his archery skills. Bheem dies last, because many a times, during the forest exiles of the Pandavas, he was inconsiderate about food. He used to eat a lot without leaving anything for others, thereby starving them. So they used to share the food among themselves before letting him to eat. Yudhistir, who did not take pride in anything (except for his pride on following righteousness) nor was biased to anyone and the dog finally reached the top of the himalayas. The dog revealed it's true Identity to be Lord Yama. Lord Yama takes him to hell first and makes him stay there for 1 day (or 1 minute or 1 second, several sources say differently), stating that a steady headed dharmaraj such as Yudhistir should also have the experience of knowing what is hell like. Yudhistir was later taken to heaven and was promised that Panchali and his brothers will join him shortly as they they get the experience (of punishment) of hell. On Earth, Parikshit was ruling his empire in a noble way and a son named Janemejaya was born to him. He crowned him the Crown Prince of Kuru Dynasty. Once Parikshit was adventuring into a forest, he met a Demon named Kali. This demon requested him to grant permission to enter kingdom and later the world. He also added that Kali Yuga should start as per the laws of nature and in this yuga, righteousness and noble qualities will degrade and the world will be thrown into imbalance. King Parikshit refused and said that as long as he lived, he will not allow Kali to occupy this kingdom and this world. Since Parikshit was as mighty as Pandavas (May be more than them, it depends on sources) Demon Kali requested for a negotiation. 1. Prostitution happens, 2. Animals are slaughtered, 3. People gamble with wealth and property, 4. People consume Alcohol and other drinks, 5. Where Gold exists. On some sense, these 5 are great sources of evil even today). By his permission to reside in places where gold exists, Kali went to reside in the crown of Parikshit and started to control and corrupt Parikshit's head. Under the influence of Kali, he in his mentally deranged condition, took a dead snake, made it similar to a garland and put it on the neck of a Rishi named Shamika and went away. The Rishi was insulted, and on seeing this act, the Rishi's son Shringi (who, apparently cannot control his anger) gave a curse to Parikshit that he will die by a serpent bite within 7 (in some sources 10) days. But the Rishi was sad and surprised because of two things. The imbalance of the punishment and power. (As per the Rishi's opinion, this is not a great sin that can be punished with death curse). Second, Laws of judgement/punishment/dharma is failing. The implicit message is that people have started to get very great powers and are capable of misusing them very easily. Moral values will fade and materialistic things will gain more importance than the righteous things. Parikshit became normal after this incident, realised that he will die and listened to the Bhagavata Purana from sage(s) for the next 7 to 10 days till death. As per the curse, Parkishit was bitten by a snake and died. (Some sources say that this snake was actually the serpent king Takshak, who sworn to kill Arjuna or his lineage because he captured Khandivaprastha by burning down the magical forest occupied by the snakes. Later the Pandavas with the aid of Lord Krishna and Lord Indra transformed Khandivaprastha into the grand city Indraprastha ( present day New Delhi or atleast close to it.) which was supposed to be more glorious and economically prosperous than Hastinapur.) And as soon as Parikshit died, Kali Yuga prevailed in full dominance. Parikshit was so mighty that he was able to delay the onset of Kali Yuga for 7 to 10 days. The angry crown prince Janamejaya, now became the king and ordered to start a grand yaga to kill all the snakes in the world. While the yaga was in progress, his fellow court people advised him that it was a grave decision and pleaded him to stop the yaga. The yaga was stopped and they all explained to him about the entire lineage of Kuru Dynasty, right from the Lunar Dynasty's founder, following down to King Bharat (Who united our country and gave the name "Bharata"), King Hastin (Who founded the Hastinapur City), King Kuru, (Who officially formed the alternate name, Kuru Dynasty) and proceeding down to King Shantanu and all the way till present day events of Mahabharat. Janamejaya forgave and continued his reign in the foot steps of his ancestors. In due course of time, the entire Kingdom of Kuru was becoming rebellious and restless with chaos and adharma. King Janamejaya did his best to restore dharma. Possibly because of Draupati's curse in Hastinapur court when she was disrobed (only to be saved by Lord Krishna) or because of some other reason, the Hastinapur city was hit with a massive flood and sunk into the ground. The capital was shifted to some city (name not sure) some where south of it. In a situation of great political and economical unrest, King Janamejaya was forced to wage a war against some enemy invasion (or an internal civil war/rebellion etc.,). At the end of the war, he was dethroned by the enemy king and possibly killed. Janamejaya had no progeny and hence the Kuru dynasty ended. After Janamejaya died, the very last survivor who has some power to stop Kali is gone. On a parallel note, after Kurukshetra war, the Yadavas, who did not take part in the war became more and more "adharmic" and nearly 36 years after the war, some of the Yadavas after getting drunk, started a fight among each other due to differences of opinion or mutual hate (It's a complicated set of reason, but as far as my understanding goes, it happens more or less immediately when Parikshit was corrupted by Kali). This fight became a serious one and in the process, all of Lord Krishna's sons including the noble Pradyuman and several other powerful Yadavas met with their doom, to such a point that the Yadava clan almost got wiped out. (Some sources say that the clan and Yadavas died completely and some say that there were a few survivors who suffered a lot and existed in Kali Yuga.) Lord Krishna and Lord Balaram did not prevent this uprising. Both of them fled to the forests and started meditating to calm themselves. While doing so, a hunter, who was hiding in a bush, mistakenly pierces Krishna with an arrow, thinking him to be a deer. Later the hunter (Who was King Baali, Bother of King Sugreev of Ramayana time in his previous birth) begged for forgiveness. Krishna said that this was not his fault and dies. Later Balram also dies. (Not sure how, but apparently immediately when Krishna died.) This was because of Queen Gandhari's curse. At the ending of Kurukshetra war, possibly, on the 16th or 17th day evening of the war, Queen Gandhari came to the battle field and was extremely sad and devastated to have her 99 sons (except Duryodhan) killed by Bheem. When Lord Krishna went to offer his condolences, Gandhari in fury asked Lord Krishna why he did not end the war in a moment's notice though he has the power, and let it proceed. It was King Dhritarastra's fate to be born blind and having his 100 sons killed in this life time (There is a story behind this regarding a tyrant king, a swan and it's 100 cygnets.) But Gandhari did nothing in her past lives nor in her current life to receive such brutal suffering. Gandhari, in her desperation and rage, gave a notorious curse to Lord Krishna: To feel the pain she is facing of having her sons being killed, Krishna will see the entire of his Yadava clan, die infront of his eyes and his kingdom will burn to the ashes. He and his brother will be left with no lineage to rule. All of Krishna's sons will die in a massive fight that will happen in Dwaraka. Krishna on the other hand will have no power to stop this war and will flee to the forest without any weapons. There in the forest, unarmed, he will be killed by a hunter and later, the entire city of Dwaraka will sink into the sea. The remaining Yadavas, who survive the war will be suffering a lot because of chaos and facing all the above misery. Lord Krishna, though he had the power to nullify the curse, wholeheartedly accepted the curse. With Lord Krishna dead and with no saviour to save the world from evil, Adharma will flourish in the Kali Yuga. As per the Hindu mythology, we are living in Kali Yuga. Since this is the last yuga in the current cycle of the cosmos/life decided by Brahma, to cleanse the world of evil and to end Kali Yuga, Lord Vishnu said that he will take the 10th avatar namely Kalki Avatar when adharma reaches the pinnacle and end the world to start a new and fresh cycle of life. Lord Parashuram, one of the 7 immortals (chiranjeevi) of the Hindu mythology will be the guru for Kalki Avatar. 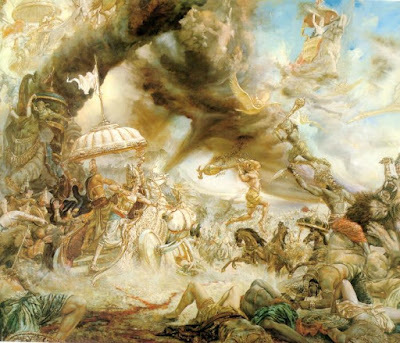 All the 100 Kauravas were killed by Bheema in the battle field of Kurukshetra. They all went to heaven directly. The reason is because of the Kurukshetra Land itself. Kurukshetra roughly translates to "Kuru's Region" in Sanskrit. As the meaning suggests, it is named after King Kuru of the Kuru Clan. This land has been known as Uttravedi, Brahmavedi, Dharamkshetra and Kurukshetra at different periods. When King Kuru came on this land it was called Uttarvedi. He performed several righteous acts and embedded 8 good virtues in this land. (Source: Kurukshetra). If my understanding goes right, the Lunar dynasty became a little weak before King Kuru came in. He was responsible for bringing the Dynasty to it's former glory. Lord Vishnu was pleased by his righteous acts on this land and granted a boon to him. As per his wishes, the land will have all the 8 virtues and will be perennially holy. Any person dying here doing his duty will be cleansed of all evil and will get the wishes to heaven. This way, EVERYBODY, including the 100 Kauravas who died in the war, on this land will go to heaven. Also, by King Kuru's righteous acts on this land, Lord Indra was pleased and offered his blessings to re-establish the dynasty and the kingdom. (Lord Indra was the king of all 3 worlds and it was the moral obligation to get his blessings to rule the Kingdom. This is why the Pandavas, because of Arjuna's valiant acts were able to please Lord Indra and get his blessings to establish the Indraprastha Empire.) This was why King Kuru's rule was influential. As a respect to his deed's, the Lunar Clan was also known by the name Kuru Clan. As a consequence of the good nature deed of Kuru, the Kauravas by-passed hell and went to Heaven. In an interesting twist of turn, According to the Mahabharata, after entering the heaven/swarga with a human body on Indra's invitation, Yudhisthira witnessed that Duryodhana "was seated on a beautiful throne and he shone with the splendour of the sun and around him stood in attendance the goddess of heroism and other angels." Yudhisthira found this insufferable and reminded the dwellers of swarga about his sinful deeds. Following that, Narada smiled at Yudhisthira and said that "the brave Duryodhana had attained his present state by force of kshatriya dharma." The Mahabharata further mentions that in svarga, Duryodhana and his brothers "attained the state of the gods. Karna died in the hands of Arjuna. Moments before his death, he felt a great deal of pain and suffering to keep up with his Dharma. Some stories say that even in his death bed, he was asked to give some charity which he gave, despite him being inches away from death. Arjuna promised to Karna that he will take great care of Karna's 9th and only alive son Vrishakethu, because he was only son who survived the war as he was too young to participate in the war. Arjuna promised that he will teach all the military warfare and other related education to his son and added that the throne of Indraprastha will be given to Vrishakethu. He was raised and supported by Arjuna and Yututsa. After death, the soul of Karna did not get into Heaven or swarga directly. His soul was feeling extremely hungry and tired, and bonded to Earth. When he asked the Devas and others in heaven for answers, they replied that Karna did almost all charity to the world, except the charity of food. He had never given food for any people or animal as a charity (Not that he never wanted to give or refused to give, it is that nobody asked him nor he thought about it). Realizing it, he was given permission to complete this deed. He went back to Earth and gathered some grass and fed it to a hungry cow. The cow was very happy and was thankful to him. As and when the cow's hunger was quenched, his hunger also quenched and he felt extremely happy and peaceful. He reached the heavens and he was given a great hero's welcome with all Devas praising him for his charity, valiance, friendship and trust. Later, he went to Suryalog (the part of heaven controlled by Lord Surya) and was happy to meet his father Lord Surya and all his dead 8 sons happily welcoming him. From the heavens, he saw the world below. On Earth, Karna was praised and appreciated for his great efforts. He finally got what he wanted for. Appreciation and Recognition to talent and skill. He felt extremely happy to see his entire life's struggle ending in a good note. After Yudhistira's coronation, Yuyutsa was appointed as the guardian for the Indraprastha reign and he was taking care of Vrishaketu. 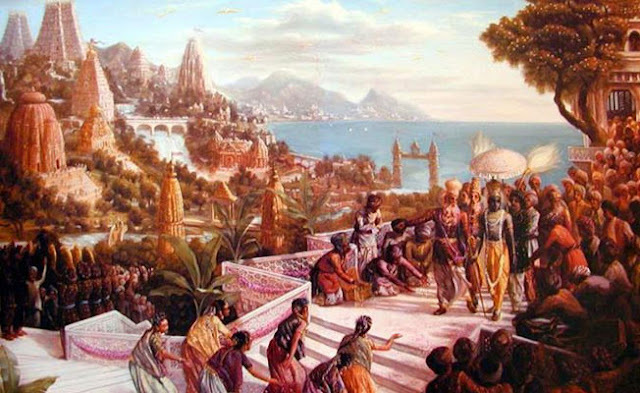 Slowly and steadily after the pandavas left the world, adharma started prevailing in the reign. When he intervened to solve the issue, he was termed as a "Blood Traitor" for double crossing his Kaurava Brothers and joining Pandavas. Yuyutsa felt shocked and surprised. How he died and what happened to him afterwards is something I am searching for. Although King Janamejaya died in the war without any progeny, some sources say that he was succeeded by a few more kings. Apparently, while I was searching for some answers, I found this detailed answer by Mr. Sourajeet Mohanty to the question Mahabharata (Hindu epic): Who succeeded Janamejaya of son?. Aswathamma is said to be the one of the 7 immortals in Hindu Mythology. As mentioned in the above, he will be still alive and shall the pain of his injuries and cannot die, even when he wishes to do so. Some scriptures say that he still visits some temples in India. He is said to be forever roaming and avoiding human contact. In some versions, he is portrayed to become a Rishi/Sage due to his change of ways after facing several years of pain and suffering. Also, he was responsible for splitting/partitioning some parts of vedas, as per some sources. Very little is known about Dushala, the younger sister to all the Pandavas and Kauravas. She was married to King Jayathradhan of Sindh Kingdom due to political reasons decided by Duryodhan. (What where is intentions is quite unclear to me. Will let you all know when I find it out.). One of his intentions, however, is to gain his friendship for he is known to be a strong warrior. Jayathradhan was known for his split personality and uncivilized mannerisms to women in general. He had a son with Dusshala named Suratha. After being killed in the war, Dusshala raised Suratha all by her own till he reaches a proper age to be crowned as the King. This was taken from Wikipedia, This explains what I wanted to say more in detail than what I could articulate. "After the war, Yudhishtira, the new king of Hastinapura, takes out an Ashwamedha Yaga wherein Arjuna follows a sacrificial horse with his army. The horse enters the Sindhu territory. Dussala's son Suradha, who was ruling this land, dies of fright on knowing about the approaching army. But he had a small boy. Dussala takes this boy and approaches Arjuna and tells him to show mercy on the boy. When Arjuna learns that he is responsible for the death of Suradha, his nephew, he feels totally shattered. He tells Dussala, "I did not come for war, I came for peace". Now it is Dussala who is shattered. Arjuna appoints the boy as the next king of the Sindhu kingdom. Dussala tells Arjuna, and perhaps the whole world, "We need peace. Let us end this strife forever. No more, never, this war." Why Pandavas landed in Hell? to the top of Himalayas to reach the Heavens. 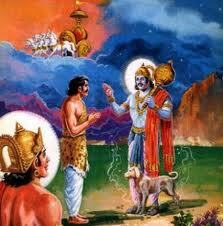 Had they died naturally or in the Kurukshetra war, I believe they would have landed in Heaven. I won't completely agree to this explanation, But of course, other explanations are possible. Bheeshma died in his death bed of arrows nearly 6 months after the war. If my understanding is correct, the war happened somewhere in December and January, but after the Northern Hemisphere Winter Solstice. The Sun has crossed the Tropic of Capricorn and it is the Northern Hemisphere Winter Season. Pitamah Bheeshma lay of his bed of arrows holding his life for the sun to cross the Ecliptic and reach the Tropic of Cancer or the Northern Hemisphere Summer Solstice, which is in the end of June. According to him, dying when the sun had crossed the Summer Solstice is auspicious and dying when the sun was at the Winter Solstice is inauspicious. So, he waited nearly 6 painful months on his death bed of arrows, without food or water or medicine for the sun to pass and then died. This part of the section is something I found very curious. Some sources say that he will be born in the Hindu month of Chaitra (chittirai in Tamil) or somewhere between March and April, to a Brahmin couple. He will carry an astrological sign of Aries. Some Astrologers tried to predict Kalki Avatar's birth time. They have several predictions.